Welcome to Friday Potluck #16! and a VERY Happy New Year!!! I hope that this lovely week kicks off what will be a fantastic year for you! I think that this week may once again be a little slim on entries, but I look forward to seeing what you bring to the party this week... and into the new year!!! Once again, I've pre-scheduled this post as I expect to be traveling still when I'd like this to be posted. For something a little fun, please add a comment with one of your New Year's foodie goals! 1. Add the button above or a link back to this post/my blog in your own fabulous blog post. 3. Leave me a note to let me know you've entered. 4. Visit some of your fellow potluckers' posts to get inspired! 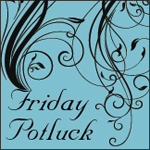 AND, if you want to join in Friday-Potluck Daily, please let me know your Twitter handle. I'll follow you (you can follow me @ekatskitchen). To subscribe to the paper click here and then click subscribe! "Kitchen Sink" Smoky Baked Beans! Friday Potluck #13 - fixed!